As the warming sun heralds summer in the D.C. metropolitan area, it’s time to begin searching for the right music to infuse the balmy nights that will inevitably follow. And what better way to enjoy a warm summer evening than with free, quality music concerts? One of the staple venues for outdoor summer concerts in the D.C. area is the Mansion at Strathmore, which is preparing for its 28th season. Scheduled every Wednesday evening at 7 pm from June 20 – August 15, the outdoor summer concerts are free and open to the public. Strathmore has as its goal “affordable, accessible, multi-disciplinary arts programming”, and the summer concert series is a central manifestation of that mission. 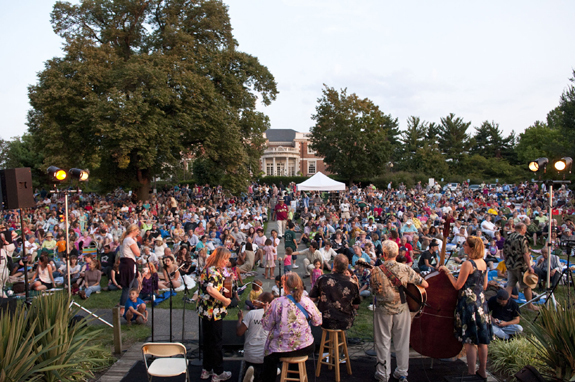 Translating “accessible arts” into a program of diverse musical styles and genres, the 2012 Free Summer Outdoor Concert Series will offer a varied repertoire. From Incwell and The Free World’s blend of rock, hip-hop, R&B and urban-inspired lyrics to the Elijah Balbed Jazz Quintet, and from Lyndsey Highlander’s pop/country sound to the Afro-Caribbean rhythms of Bachata artist Joan Soriano, this season’s program highlights musical influences from around the world. There’s a strong underlying theme, however, that ties the diverse programming and amalgamation of sounds together. Most of the artists on the 2012 program either herald from, or are now based in, the D.C. area. This focus on the local reinforces Strathmore’s mission as a community-based arts center, amplifying the sounds of the artists who represent the D.C. metropolitan area around the country and honoring them with a spot on the stage back home. The Strathmore Free Outdoor Summer Concert Series kicks off on Wednesday, June 20 and continues through August 15 with weekly Wednesday concerts. Concerts take place at the Gudelsky Concert Pavilion in North Bethesda, MD. All concerts are free with no tickets required. Strathmore also has a number of upcoming concerts to round out its May calendar, including two performances by the Baltimore Symphony Orchestra. *All photos credited to Strathmore performing arts center. How To Tango in D.C.